When you enroll in Abeka Academy, you have two options available to you. You can choose the video program or the parent-directed program (no videos). If you choose the video option, you have two choices with that program too. You can get the videos sent to you on DVD or you can get Internet video streaming where you receive the videos right on your computer through your Internet connection. If you have a slow internet connection or dial-up, then having the videos sent to you would be the better option. There aren't too many things more frustrating than being all ready to watch something and have to sit there and wait for it to load. Many times these types of programs start working and then stop several times while you are trying to watch them. Abeka's video option will be more expensive, but it just depends on your homeschool budget and goals for education. What Do You Get with the Video Program? - Abeka Academy includes an accredited program where you view the videos just as if you were in a classroom setting. The teachers are teaching to a class and your child watches the classroom instruction. The videos are organized by day. Although you can’t ask the teacher any questions while you are watching, you can stop, pause, or rewind the video at any time. You can also email or call in any questions you might have. DVDs are just leased from Abeka so you won‘t be able to find them used or cheaper from anyone else. Although you can own the textbooks, you can’t own the DVDs. The classes are not live, but with the accredited program must be viewed in order. You can work ahead if you want and you have 10 months to complete the courses. Parents must grade all quizzes and tests and keep the students on task. They also grade any reports or papers. If you choose the parent-directed option, then you are still enrolled in the academy and receive the same books, just not the DVDs. approximately 3 hours of video to view each day for grades K-6 broken down into 15-20 minute sessions. all work must be done in cursive. Grades 9-12 can use a computer or typewriter. DVDs or Internet video streaming? - Basically, you receive all the same information, books and instruction with both programs. The Internet video streaming is $100 cheaper because there is no shipping or handling of products. The video option also includes all DVDs or Internet videos depending on the option you choose. If you have no Internet connection or a poor Internet connection, you will probably have to go with the physical DVD option. 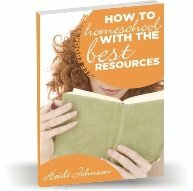 Free ebook - "How to Get Started with Homeschooling"
Get a complete review of the pros and cons of Abeka at Abeka Review.